With a single stroke of the brush, the ultra hydrating formula's light-reflecting pigments blur imperfections for an instant anti-aging effect. Below the surface, the innovative formula takes a triple action approach to revitalizing, smoothing and brightening the complexion. 1. Our Anti Fatigue Tetra-peptide acts as a rejuvenating force, inhibiting the glycation process and reducing capillary permeability. The unique complex de-puffs the under eye area, helps reduce dark circles and enhance skin's elasticity. 2. A unique Brightening Active, further boosts luminosity. The botanical-based active helps even out skin tone by reducing skin's own melanin production and preventing the formation and darkening of sun and age spots. 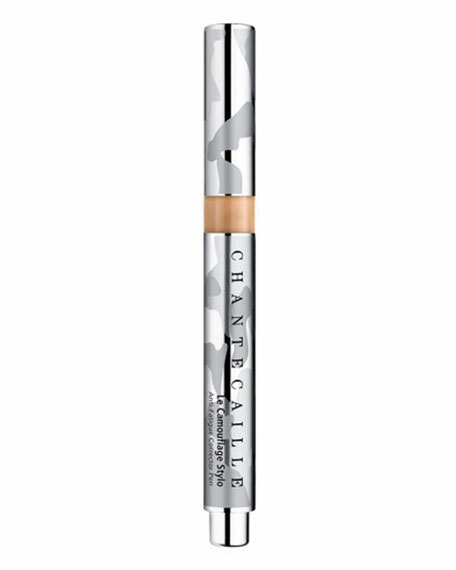 Packaged in a camouflage silver click pen, the smooth brush helps blend the buildable formula seamlessly to create a natural, undetectable look. The crease-free coverage stays put all day.